Own vs Control, what's the difference? What happens when I sac Gilded Drake in response to using his effect? Forget Inky, Pinky, and Clyde! I love random chaos decks with no nature to win. 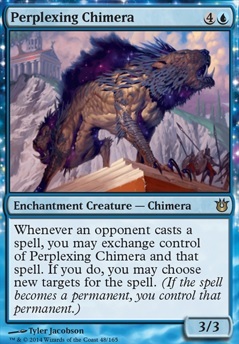 Might I suggest Perplexing Chimera as almost a pseudo-counter that hops around the board. Everyone trading spells. And I see you have Knowledge Pool which completely changes everyone's strategy. When the two cards are paired together, too, everyone basically chooses who casts what spell. Enhanced Surveillance performs in this deck very well, because I've put many cards with the Surveil-ability in it. The second ability of this card is also useful in an emergency case like any effect is going to exile all graveyard cards. If those cards go back into the library it isn't the worst, for sure better than getting away from the game. 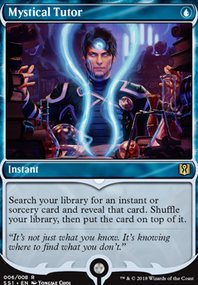 This card is no power-up, but I like it a lot and with many Surveil-cards this enchantment fits in this decks strategy. I don't see this card in your deck, you have a lot of cards to loot cards like Looter il-Kor , Key to the City ,.. and not so much Surveil-cards. In my opinion Enhanced Surveillance needs many Dimir cards with the named ability. This is just a fine difference between our decks, guess it's not worth to skip any other card for this specific one. Yes, Telepathy is awesome, especially in this control-fancy playstyle. In commander we know that we can't counter everything (and that's for so many reasons really good!) so this helps a lot to get advantage in the game. I recommend this card a lot. It doesn't do anything on it's own, but not only you can see other players hand. Each opponent may get suspicious too when seeing any other opponents cards. 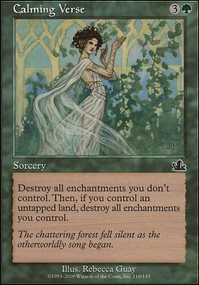 I see this card in any deck which has a passive strategy. In my deck there are of course many possible upgrades, but I'm not interested to rise up the power level to a 9 or 10 of 10. First it's hard to achieve, second those decks have a very strict game plan and last I like to play anything interesting like Thief of Sanity , Mnemonic Betrayal ,... Recently I changed some cards, hope it does work well. 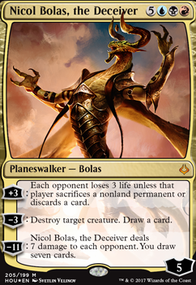 One card I try is Dark Confidant over Phyrexian Arena , because of a very low average CMC and the Confidant is in addtion a creature card too. I'm monitoring your deck as well and I like it as a really good reference. To your question of which cards I'm considering at the moment: Perplexing Chimera , Dimir Doppelganger and Psychic Intrusion . I've put in Ashiok, Nightmare Weaver to force the deck theme in a specific direction. Alright. I think I know where this deck should go. However, w/ all such garbage in the fray, I actually have more to ask than show as a result. Here we go... Again. It seems my creatures seem to have an ETB theme in mind; most notably for the use of Eldrazi Displacer . 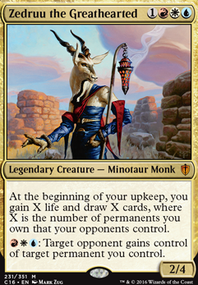 What exactly do you think would be a good alt in a situation where ol' Displacer: Enemy of Eldrazi, & their Ultra Beast from there? How to protect this? After watching a recent episode of GAME KNIGHTS, one such combo jumped out of the water. Perplexing Chimera & a Bounce Combo ( Eldrazi Displacer again.) to not only get the permanent you traded for, but also getting the Chimera back. Is this legit? We seem to have a Flicker/ETB theme for the most part. What would you recommend in Yennett's colors ( BTW.) for alts, or even protection? I dunno why, but I thought of Putting in a Doomsday package in. After being suggested Predict , I have Laboratory Maniac , & Pact of Negation . I also have Gush after changing my mind. But I still have only 4/5 Pieces. 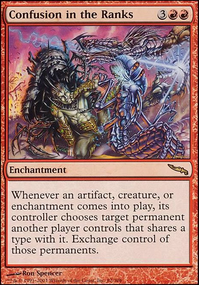 I also want to use this whenever I use DOOMSDAY on the same turn I draw it; while ending games with the package. What would be the last card you'd recommend? Besides Lion's Eye Diamond , & Yawgmoth's Will , of course. If I would put the following combo in: Maralen of the Mornsong + Necropotence + Children of Korlis in, is it really better to put Leonin Arbiter in in place of Mindlock Orb ? It does cost less, & his ability to bypass one's own ineptitude of searching is great. Plus, I've too much anyway. I think I should cut down. What about you? Since this deck is meant for the largest amount of hate possible, how does Leyline of the Void & Tormod's Crypt seem here? ...Though 5 Color Gates.dec might seem like a great idea... Thoughts? Hey, saw this on the Reddit EDH page. 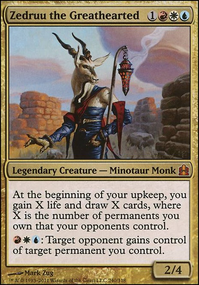 I run an Aminatou list that is on the high end of the focused spectrum and can hold it's own agaionst cEDH decks. Here's a few thoughts. 2: Your CMC is too high. Lose as many cards over 4 CMC as you possibly can. 3: Lose the off theme creatures. 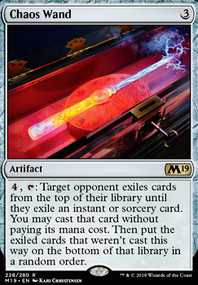 Does it have the words "exile" or "enter the battlefield" on it? If the answer is "no" cut it. Doom Whisperer and Yennett in particular I would cut so fast I'd get cardboard burn. The single exception to this is Glen Elendra who despite not having an ETB is still a blink target. If it doesn't interact with blink or enable blink, toss it. 4: Perplexing Chimera is a one card lock that buys you time to look for things to end the game.